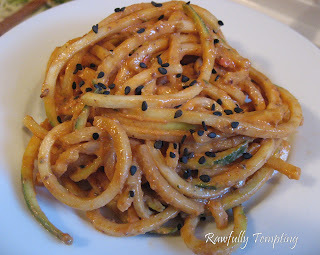 Google+ Rawfully Tempting™: Oodles of Noodles, Lotsa Pasta, and Other Spirally Thangs! Oodles of Noodles, Lotsa Pasta, and Other Spirally Thangs! I taught this Pastapalooza Class at Organic Avenue. 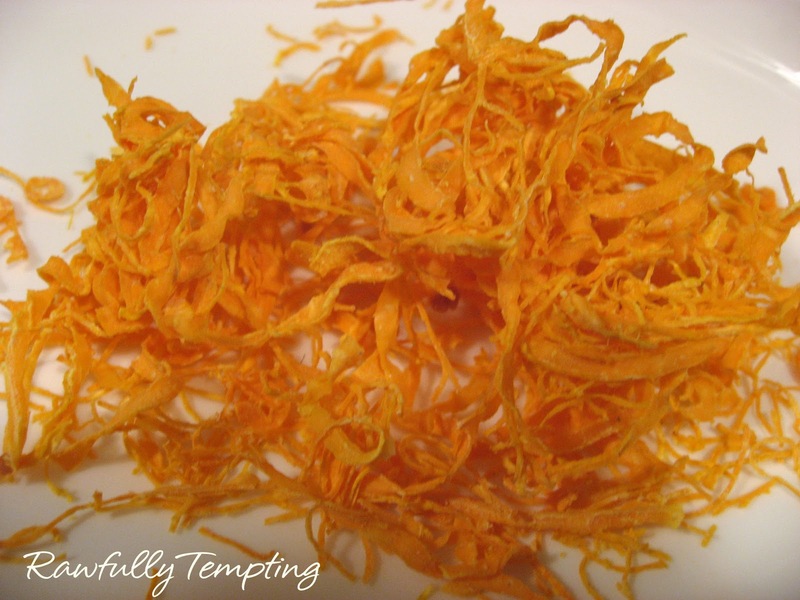 Using two different spiralizers, I and came up with a few fun treats. Spiralizers are two of my favorite kitchen tools, and I could not imagine my life without them! 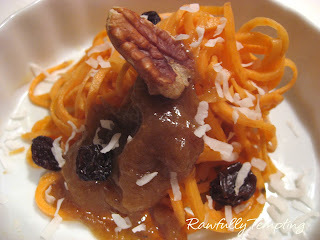 The photo above is spiralized Garnet Yams, which are not really yams at all, but beautiful red (on the outside) sweet potatoes. I am fortunate to have 2 different spirazers which in total, contain 6 different cutting options. Using the smallest "angel hair" blade, combined with the medium blade, I came up with 2 lovely variations of noodles, which I seasoned with sea salt, garlic powder and onion powder. Spread on a non-stick dehydrator tray and dehydrate at 110 degrees F for several hours. They dehydrate quickly! Enjoy! 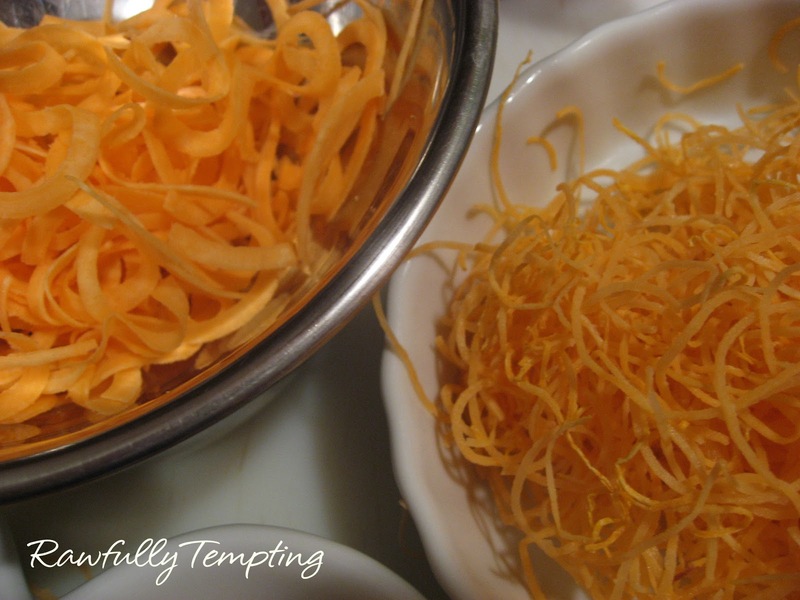 I LOVE LOVE LOVE the Paderno World Cuisine Spiralizer. I prefer this machine for any vegetable that has seeds in it, like zucchini, summer squash or cucumbers. 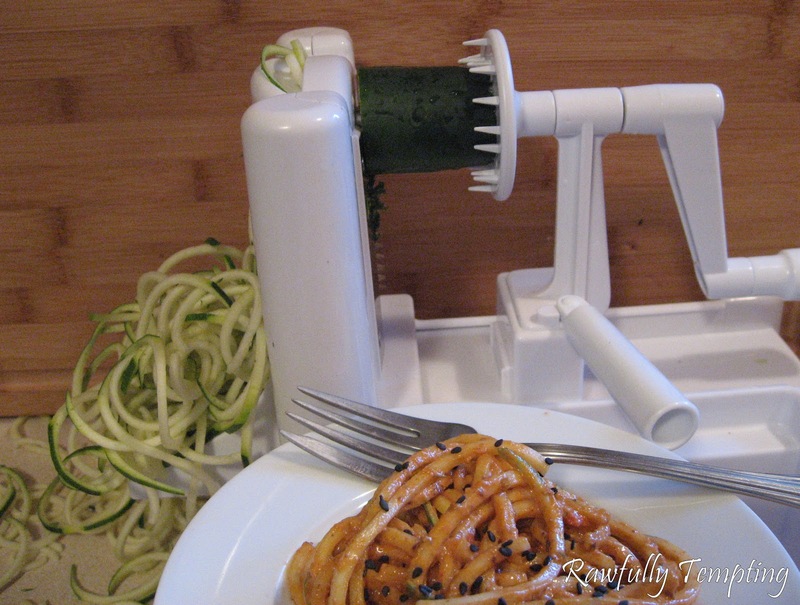 This spiralizer has a center tube that removes a good majority of the seeded core as you cut your "pasta." This results in crisp, beautiful pasta-like strands that don't get limp and watery on your plate. 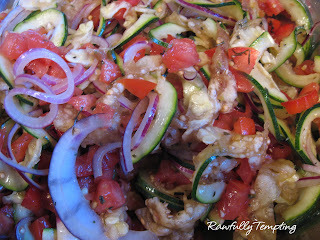 The smaller spiralizers do not remove the core and so the veggies with seeds, get super watery and I find this annoying. 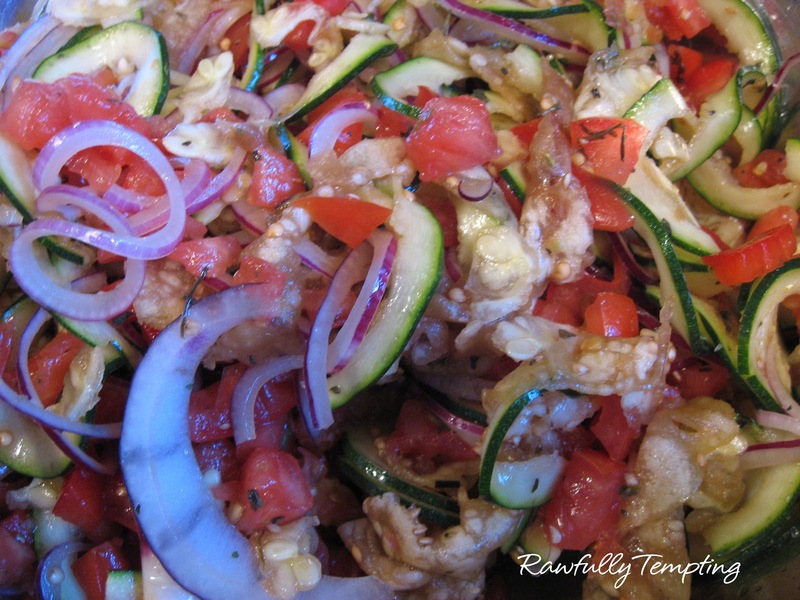 With the World Cuisine spiralizer, I can actually cut my "pasta" the day before, store it in the refrigerator, and have it be fresh and crisp the next day! However, for firm fruits, vegetables and roots, like sweet potatoes or kohlrabi, I really enjoy using the Benriner Spiralizer (The green one). This machine does not remove the center or core, and seems to cut really nice angel hair pasta noodles or a flat linguini noodle, depending on which blade you use. The only drawback with this machine is that it is vertical and only opens up so far, so you have to cut your food into a small enough piece to fit between the two ends of the spiralizer. This creates a little more waste, and makes it a little less convenient. (Save those ends for juicing, soups, breads and crackers). I love having both of these spiralizers n my kitchen. The investment is very minimal, and gives you the ability to create a wide variety of textures, from a paper thin ribbon cut, to a fat spaghetti-like strand. 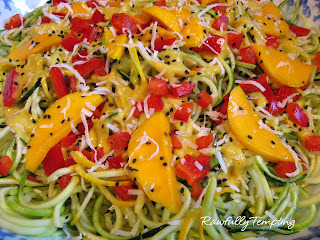 This photo was done using both spiralizers mentioned above. It's nice having both to be able to create different textures. Get creative! 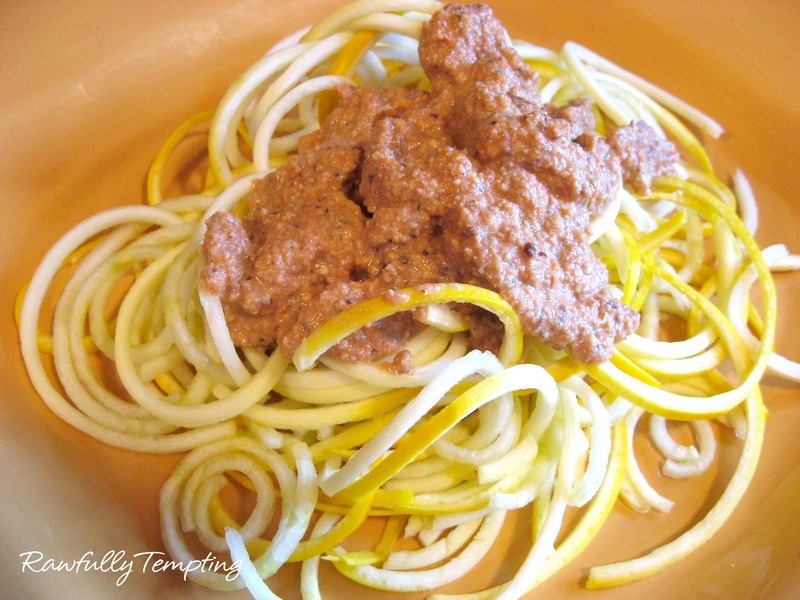 Spiralize some veggies and create your own delicious sauce recipe! Try using some veggie or nut pulp in the mixture if you have some saved. YUM! If you are interested in something similar to the Pastapalooza Class, demonstrating these two machines, and teaching how to make some scrumptious "pasta" dishes, please see the SERVICES tab and contact me for more information. I'd be happy to create a fun class for you and your friends. I thoroughly enjoyed learning all about transitioning to a raw foods lifestyle at your Pastapalooza Class at Organic Avenue. The food was amazingly delicious! I walked home with a spring in my step and a clear head and, though I had not eaten much all day, I was completely satisfied with the tasting portions, which were incredibly filling. I've ever eaten raw before, but Barbara sold me with her vivacious attitude and solid explanations. Well done!! 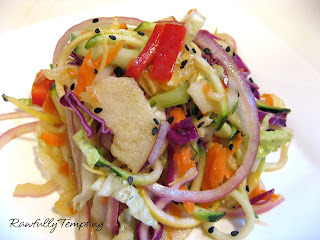 I highly recommend her classes for newbies like me or even seasoned raw food lovers. Thank you so very much for your kind words. I am so very happy that you enjoyed the workshop and walked away with a different perspective. Blessings!!! Now I wish I could have attended your workshop, i absolutely love raw zucchini pasta, but for some reason, I never considered a spiralizer to be a worthy investment. Boy, was I wrong! Just look at all the amazing dishes you can make, and not just noodles. Definitely something worth investing in, even if you didn't normally consume noodles, you just might fall in love with them. Thanks for sharing some of the great uses of a spiralizer, I've grown very interested in what can be done with it.